A white-hot synth with multiple oscillators, a dual DSP system, sample-accurate timing, and more. The Access Virus TI v2 Polar Total Integration Synthesizer is a synth-action keyboard that has 37 keys featuring velocity response and aftertouch. The Virus TI also has Hold and Control pedal inputs. For a longer list of features and its I/O options, look below. Like all members of The Virus TI platform, the Virus TI Polar v2 Total Integration Synthesizer is the sublime fusion of a 12-year triathlon in sound research, distillation of user input, and the simple desire to create an exceptional instrument. Conceived as a virtual analog synthesizer, it grew into a multi-synthesis workstation which seamlessly integrates into your production environment using Access' unique Total Integration plug-in technology. This second version edition features 25% more calculating power and a completely redesigned housing. The aesthetically pleasant Virus TI v2 Polar has a winter-white finish, with aluminum and wooden side panels, as well as white LEDs and display, with a wood rail beneath the keyboard. This second generation Virus TI platform features a wealth of inspiring oscillator models such as virtual analogue, hypersaw, wavetable, and graintable oscillators, along with several filter models and a new-to-the-line Character control for emulating the vibe of old analog gear. A ring shifter, several FM types, and a tape delay add the warm lo-fi sound featured so often in music today. The effects section delivers multiple, simultaneous effects including reverb and delay per part, ensuring your patches sound exactly the same in single and multi mode. The concept of totally integrating a synthesizer, which essentially means streaming audio from the Virus TI into a plug-in hosted by your digital audio workstation, is certain to make some positive waves. Total Integration is Access' proprietary technology, which seamlessly links any Virus TI model and a computer to create a unified system consisting of a powerful hardware synth and a virtual instrument plug-in, which not only controls the Virus TI but also receives audio from it, in order to allow post-processing right inside your computer. This way you get the best of both worlds. Your Virus TI will calculate all the voices and effects and therefore makes the CPU of your computer available for other tasks. Since it is driven by the Virus Control plug-in, the timing (unlike normal MIDI and USB-MIDI timing) will be sample-accurate, and all sound data will be saved within the song or project. Virus Control also offers sophisticated editing capabilities, along with an easy-to-use librarian page to keep track of all your Virus TI patches. 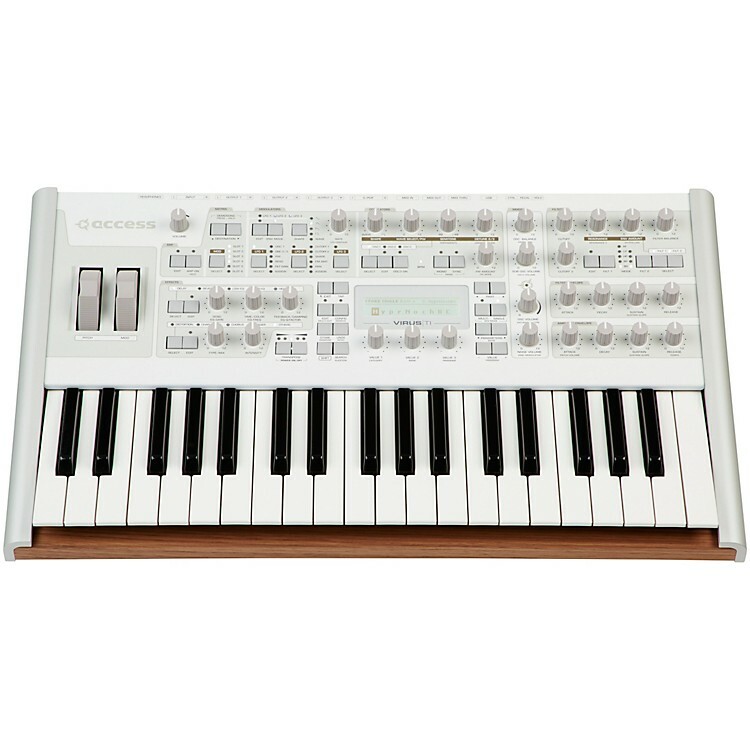 The Virus TI's analog input and outputs can also double as an audio interface, and the MIDI sockets can double as a MIDI interface. As much as a craftsman depends on the quality of his tools in order to achieve exceptional results, you can rely on the Virus to impress your audience. That's because for the success of artists today, a stunning sonic signature is as important as the unforgettable melody, and the Virus TI line provides both. Hop aboard the Virus TI v2 Polar express to take advantage of its innovative German engineering.